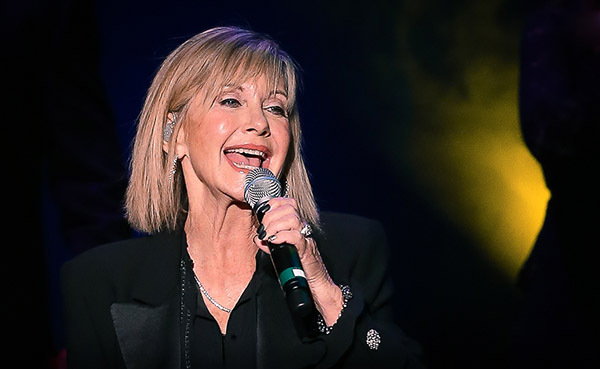 Olivia Newton-John thrills the Grand Sierra Theatre in March 2018 with songs from her illustrious career. Sometimes you just have no idea what you’re in for. 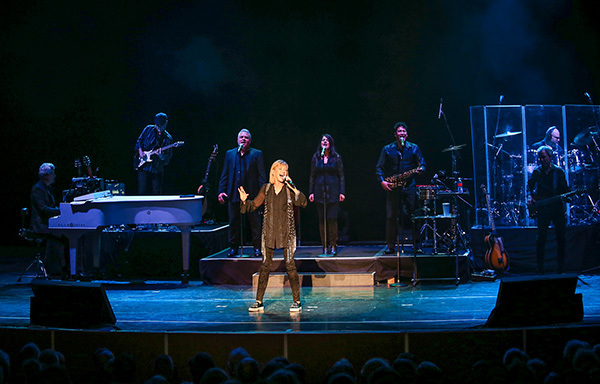 Some nights, you find yourself saying “street cred be damned” and heading out to see Olivia Newton-John perform in concert. And on occasion, what you see blows away all expectations. I’ll preface this by saying that “Xanadu,” a 1980 film where Newton-John plays Kira, a roller skating muse coming of life from the imagination of a struggling record poster artist (universally panned as being among the worst films ever) ranks with my personal all-time favorite movies. I’ve watched this movie so many times and it only continues to get better! Aside from this, Newton-John is popularly known due to having had her toes dipped in multiple eras and outposts of popular culture, from her start in 1960s Australian television, her U.S. breakout in 1970s country music, her leading role as Sandy in the film “Grease,” her oft-covered 1980s radio hit “Physical,” her name frequently tied to environmental and world poverty causes and benefits, and most recently, her attachment to the soundtrack of the “Stranger Things” series. Because of this media omnipresence spanning nearly 50 years, it’s not just hard to be unaware of her, but also, I found, hard to attend a show and not realize her role in songs that I had no idea were hers. First, it needs to be said that she belongs to an era past of performers. Her beaming smile, wholesome jokes — and bedazzled-everything collection of flowy outfits that merged showy façade with a lack of raunch — set the tone for a performance spotlighting charm and talent, backed by capable and versatile musicianship over flash and distraction. She was at times endearing – like the moment when she called to stage two girls who had approached her that morning in the airport asking for a picture. And finally, she knew how to put on a show, with a lot of egging on the Grand Sierra Resort’s packed Grand Theatre audience to sing along to the back-and-forth songs from “Grease” with her backup singers pantomiming Travolta’s character’s cool machismo and her sock hop coyness. In short, she was funny, she was fun, she could put on a show not despite the minimal stage set and production, but using it as an asset, and by the end of the night her tone of wit, graciousness and charisma was infectious. The night ended with her standing beside her piano player, singing “Somewhere Over The Rainbow,” ending to a lively standing ovation from the crowd. Some nights you have no idea what you’re in for, and it takes stripping aside the flashy choreography and manufactured titillation production of many of today’s performers and shows, to take you back to an era of nightclubs and seemingly far more intimate performances where you find yourself in the midst of a true and unique talent who doesn’t need the excess gimmicks to wow a room. P.S. Thank you, Olivia, for keeping the song “Xanadu” in the set list. “Rotten Tomatoes” be damned! 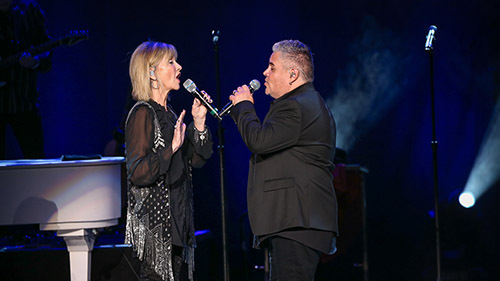 Olivia Newton-John sings a duet with Steve Real in the Grand Theatre. Shaun’s review sums it up perfectly! From beginning to end, this classy lady put on a show like no other! Olivia looked great and her crystalline voice was as good if not better than it always has been. We got her favorite flowers (white lilys) and gave them to a good friend we brought with us to give to her. Our friend, John, is a big fan and he had no idea we got a ticket for him. Needless to say he was blown away by the surprise and the performance! Love, love, love this woman! I’ve seen her 8 times over the last 20 years and I am always blown away by her shows! I am so glad you finally discovered Olivia. She hasn’t changed over the years, which is why people like I have been going to her concerts for more than 40 years. Sometimes less is better and Olivia proved that to you. Good people are hard to find but you found Olivia. For those who haven’t please catch one of her concerts and you be “hooked” for life. I was one of the lucky ones to be at this show. My son bought me tickets because he knows how much I love her. My first concert was to see Olivia with my Dad when I was in the 5th grade … many years ago :). This weekend was the anniversary of his passing and I know he was there with me! I have seen her probably 10 times and will keep going … she is the best! Love her ! It was so awesome when she called the two ladies up to take a picture … they were sitting two rows in front of us … just awesome! Great review of an awesome show!